Database Systems Corp. (DSC) has been in business since 1978 and provides both voice broadcast outsourcing services and voice broadcasting systems. DSC has also developed an Android application to manage this service remotely. Voice broadcasting clients now have the ability to manage their call campaigns using the latest Android devices. From initiating calling campaigns to managing the operation and control of these calling programs, our customers can have the freedom to perform these tasks with simple selections from the Android device. The Android voice broadcast application is ideally suited for use with emergency voice broadcasting. If your organization or community is experiencing an emergency situation, it may not be practical or possible to use a computer or laptop to initiate an emergency broadcast. Using a smartphone device may be the best option available to an administrator to send calls to your community. 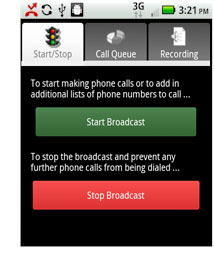 The Android application and iPhone App from DSC is available for free to its voice broadcasting customers. Once enrolled in our voice broadcast services, DSC provides an easy access to download this application onto your smartphone. DSC now provides an online signup for both non-profit and business organizations wishing to use our voice broadcasting outsourcing services. Signup is easy and can be completed in just minutes! Our competitive rates are affordable, even for the smallest calling campaign. To register online, click on one of the online registration images or buttons above. The Android voice broadcast application lets administrators initiate and manage calling programs from their Android phones. The following functions can be performed using this device. Any number of calling campaigns can be started and stopped using this feature. Administrators can manage multiple calling campaigns all at one time. This allows calls to be broadcast to different groups with different messages which is an important feature during an emergency. Besides controlling the operation of multiple voice broadcasts, the administrator can also perform call queue management. 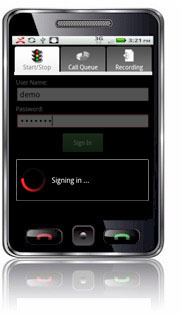 The DSC Android application allows an administrator to view the progress of each calling campaign that is running. Total number of calls is displayed. At the end of a campaign, the administrator is provided a message with the total call counts. If necessary, the administrator can return to the Start / Stop area and add additional phone numbers to the queue to place more calls. DSC voice broadcast clients all have the ability to record their voice messages using our 800 phone service. This capability has also been provided to Android users. Simply call the 800 number provided with your voice broadcast account. Users will be asked to provide an account number and will then be given several options to record a new voice message. Once recorded, the message can be played back to the caller to verify the content and quality of the recording. Once the user is satisfied with the message, it is saved for later recall with a voice broadcast campaign. Contact Us Today to learn more about our Android voice broadcast service and systems. Voice-Broadcasting-Solutions.com is Trademarked by Database Systems Corp.